Sports comedian Jeff Wozer has found the top signs that the football world is now viewing the Bills as a good team. Despite no hair Sean McDermott is considering lucrative endorsement offer from Head & Shoulders. CBS announced it’s no longer considering rehiring Solomon Wilcots to cover Bills games. The Big Tree Inn has removed “Free Firewood” sign from its wooden Bills statues. For the first time in 11 years Russ Brandon dined locally without wearing a wig and sunglasses. 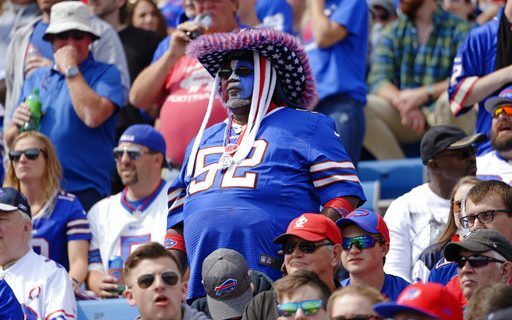 Realizing the Bills may actually be good, members of 10-man practice squad are now more focused on getting into games rather than pursuing plans of opening two 5 Guys restaurants. Hallmark no longer carries its once popular “Sorry You’re a Bills Fan” cards. ESPN announcers no longer make quotation marks when referring to the Bills as a football team. LL Bean now selling Bills logoed three-season Concussion Protocol Tents. MSG’s John Murphy Show now ranks number one with the coveted 18-49 hungover and out-of-work demographic. If you can’t tell, Jeff Wozer has his funny bone attached to the Buffalo sports scene. Read his other hilarious columns here.